Splash pages, you gotta love 'em. A blank canvas where the artist can hit you with a large dose of illustrated 'wow'. 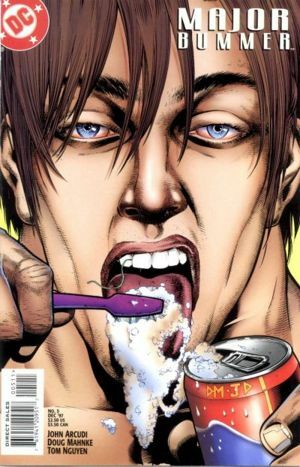 For this week's splashie, after reading what titles The Cool Kids Table wished DC had rebooted, I got a massive hunger to see MAJOR BUMMER back in print. And being the kind of guy I am, wanted you to want it back too. Sure he's speaking German, but C'mon! 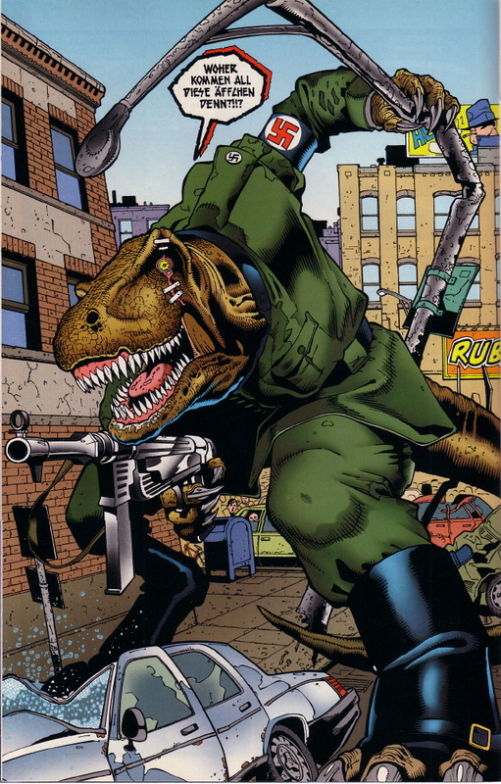 It's a giant evil Nazi T-Rex with a gun! Some ideas just sell themselves. Major Bummer was hilarious in all the best ways and many that aren't. It was zany, madcap stuff that read like it was wisked though while the editor was on lunch or slipped past their rubber stamp during Friday drinks. Tyrannosaurus Reich for his part, was pulled to earth through a dimensional portal from a dimension of Nazi dinosaurs. His rein of chaos cut short by a housecat which changes sizes when agitated (don't they all?). See! Great fun stuff - and short of Plastic Man #1 - the kind of comics we need more of! I tell you Pensol - If I could email you a free copy you'd see just how true that is!